1. Prepare and bake brownies in 13×9-inch pan as directed on package; cool. Meanwhile, beat pudding mix and milk with whisk 2 min. Add peanut butter and sugar; mix well. 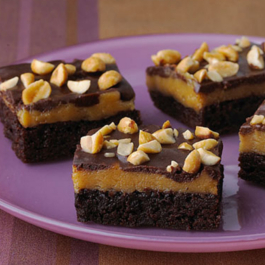 Refrigerate until brownies are completely cooled. 2. Spread pudding mixture over brownies. 3. Microwave COOL WHIP and semi-sweet chocolate in microwaveable bowl on HIGH 1 min. or until chocolate is completely melted and mixture is well blended, stirring every 30 sec. Spread over pudding mixture; sprinkle with nuts. Refrigerate 1 hour.